Mounties in Sylvan Lake are investigating threats that were allegedly directed towards HJ Cody High School via social media on Wednesday. Through their investigation, RCMP were able to locate a suspect who had been identified as the person responsible and with cooperation from that individual, police were able to determine there was no concerns for the safety of the school, students or staff. The names of the people allegedly involved will not be released due to requirements of the Youth Criminal Justice Act. However, RCMP say further investigation will take place so if you have any information about this event, contact Sylvan Lake RCMP at 403-858-7200. Or if you wish to remain anonymous, contact Crime Stoppers at 1-800-222-8477 (TIPS), or by internet at www.tipsubmit.com. RCMP contact Alberta Children’s Services after young child found in home where arrests were made. 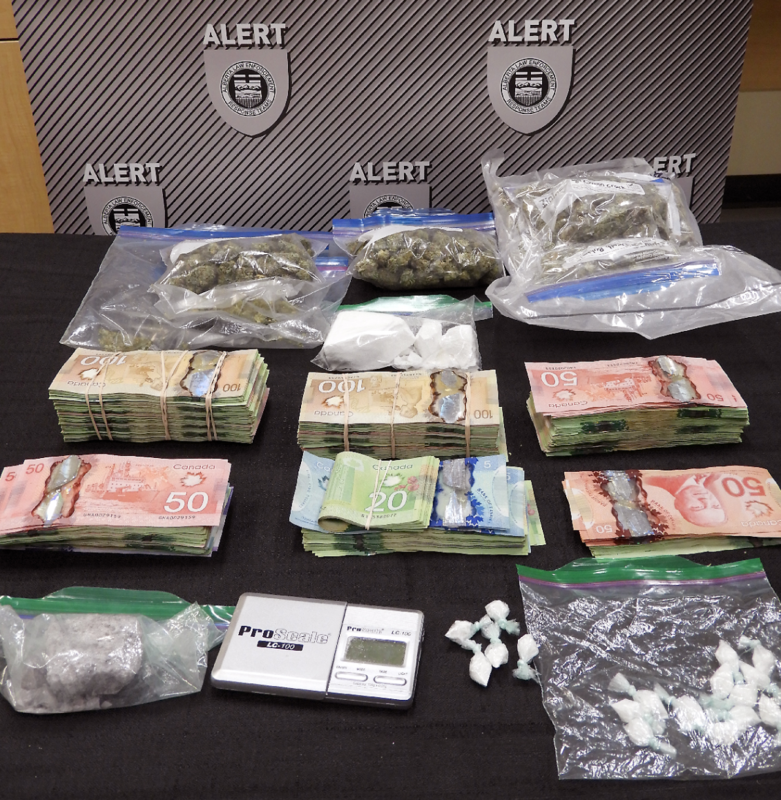 Three people have been arrested – including two on charges of child endangerment – and nearly $70,000 worth of drugs and cash have been seized following a pair of investigations by ALERT’s organized crime team in Fort McMurray. On April 17, 2019, ALERT investigators, with the assistance of Wood Buffalo RCMP, executed a search warrant at a home in the Timberlea subdivision. There, they were able to seize more than $58,000 worth of drugs and cash, including 151 grams of cocaine, 78 grams of MDMA powder, 389 grams of cannabis, and $33,230 in cash proceeds of crime. Two people were arrested and charged with numerous offenses, including some under Alberta’s Drug Endangered Children Act after a young child was found at the home. Alberta Children’s Services was notified. In a separate investigation, ALERT executed a search warrant at an apartment building in the Eagle Ridge subdivision on March 29, 2019. In this instance, investigators seized approximately $11,000 worth of drugs and cash, including 100 grams of crack cocaine, 88 grams of a cocaine buffing agent, and $955 in cash proceeds of crime. Varinder Singh, a 25-year-old man, was arrested and charged with possession of a controlled substance for the purpose of trafficking and possession of proceeds of crime. Members of the public who suspect drug or gang activity in their community can call local police, or contact Crime Stoppers at 1-800-222-TIPS (8477). Crime Stoppers is always anonymous. On Feb. 2, 2018, the Alberta Serious Incident Response Team (ASIRT) was directed to investigate the circumstances surrounding a Dec. 28, 2017 confrontation near Barrhead, Alberta, between an off-duty RCMP officer and another motorist. After our independent investigation, it was determined that there are reasonable grounds to believe the officer committed offences. As required under the Police Act , ASIRT’s investigation was forwarded to the Alberta Crown Prosecution Service for an opinion on whether the case met its standard for prosecution. Having reviewed the investigation and the provided Crown opinion, ASIRT Executive Director, Ms. Susan D. Hughson, QC, made the determination that the involved officer should be charged with four criminal offences. On April 25, 2019, Const. Barnaby Seregelyi, a member of the RCMP Wood Buffalo detachment, was charged with the criminal offences of dangerous driving, assault with a weapon, unlawful confinement, and pointing a firearm. It is alleged that on Dec. 28, 2017, Const. Seregelyi was off-duty and driving his personal vehicle just west of Barrhead when he encountered another motorist and became embroiled in a driving dispute. During the course of the incident, it is alleged that Const. Seregelyi drove his vehicle in a manner dangerous to the public, confronted the woman operating the other vehicle, pointed a firearm at her, and confined her roadside. Const. Seregelyi appeared before a justice of the peace and was released with conditions. He is scheduled to appear in Barrhead provincial court. As this matter is now before the courts, ASIRT will not provide any further information. ASIRT’s mandate is to effectively, independently and objectively investigate incidents involving Alberta’s police that have resulted in serious injury or death to any person, as well as serious or sensitive allegations of police misconduct.